Michael Moore has released an explosive poster for his new film Fahrenheit 11/9, opening Sept. 21. 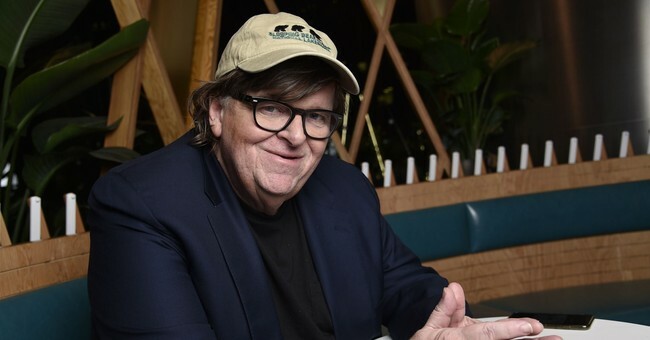 According to the documentary’s official synopsis, "Michael Moore's Fahrenheit 11/9 is a provocative and comedic look at the times in which we live. It will explore the two most important questions of the Trump Era: How the f**k did we get here, and how the f**k do we get out? It's the film to see before it's too late." It’s a follow-up to his 2004 film Fahrenheit 9/11, which sought to influence that year’s presidential election as well. That film dissected, or what Moore thinks is dissection, the Bush administration and what was our military action and occupation of Iraq. It became the highest grossing documentary of all-time. But it did not have an impact on the 2004 election. Bush won—and thank God he did. "We're optimistic," says Briarcliff distribution head Steve Bunnell, noting the film's A CinemaScore and strong PostTrak exit scores. "The idea was to have the movie play everywhere before the midterm elections." In 2004, Moore's Fahrenheit 9/11 debuted to a record-breaking $23.9 million from 868 locations. Otherwise, his films, similar to other political or specialized docs, have launched first in select theaters before expanding their footprint in order to capitalize on word of mouth. While it's true Fahrenheit 11/9 posted one of the biggest bows ever for a political doc, it is only the fourth political doc to launch nationwide, making comparisons tough. Yeah, I doubt this will match or surpass his anti-Bush work, but it will keep liberals’ hysteria mindset well nourished and progressive blood pressures low.